Hamster gets a cover too. Synopsis: Everyone is gathered around Ikusa at the beach and Chiharu and Athena remark that he’s pretty good looking and that he looks quite troublesome. 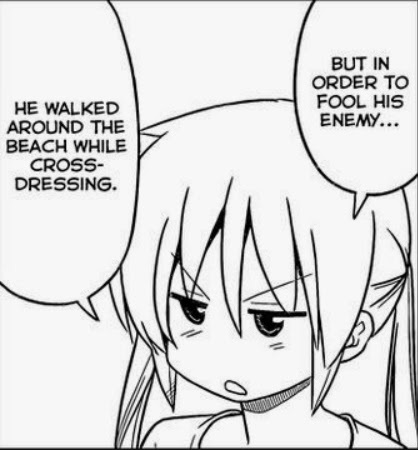 Nagi adds that he walked around the beach while cross-dressing in order to fool his enemy (Eight from the previous chapter). Cross-dressing runs in the family, I suppose. Kayura and Ayumu state that Hayate should be having a touching reunion with his brother, but Hayate says that too many troublesome things happened that he’s lost the mood for such a thing and that all he really wants is the King’s Jewel (the one he gave to Ikusa 10 years ago). Nagi and Maria remark that Ikusa looks like he doesn’t even own a shirt, so how could he have a King’s Jewel? Hamster volunteers to ask him and actually does so – asks him if he owns a shirt, that is. Ikusa replies that he owns two. Hamster then follows up by asking him if he might own something that he’s had for over ten years and Ikusa shows her the pouch that Hayate gave him on that fateful day ten years ago. Once again, nice abs, bro. 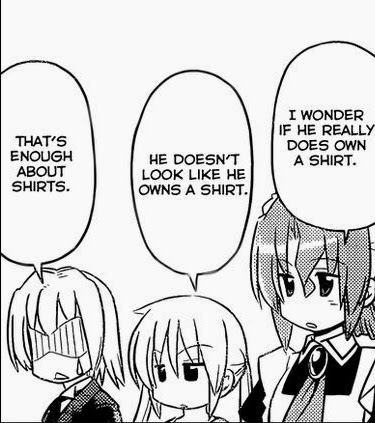 Hayate immediately recognizes it and asks his brother if he could see it and Ikusa responds by punching him in the face for trying to take it because it’s a precious treasure for him. Hayate retorts that it originally belonged to him, but Ikusa tells him to stop calling him brother. Hayate counters that whether Ikusa likes it or not, he is his brother but it’s just that he’s lost his memories. Ikusa says that he does have vague memories of his brother and he was a small, cute boy of about six, not a huge high-schooler like Hayate. Ikusa stubbornly refuses to hand over the pouch because it was a precious treasure given to him by his brother (who happens to be Hayate from ten years ago). Suddenly, one of the other Lifesavers characters, Souya appears and suggests that he and Hayate settle it with a competition. Ikusa: I'm so above violence and all that. Ikusa says that they would settle things with a beachside restaurant competition and lays out the rules. Basically, Hayate simply has to bring the restaurant called “Life” which was closed down due to bad business, back to life. 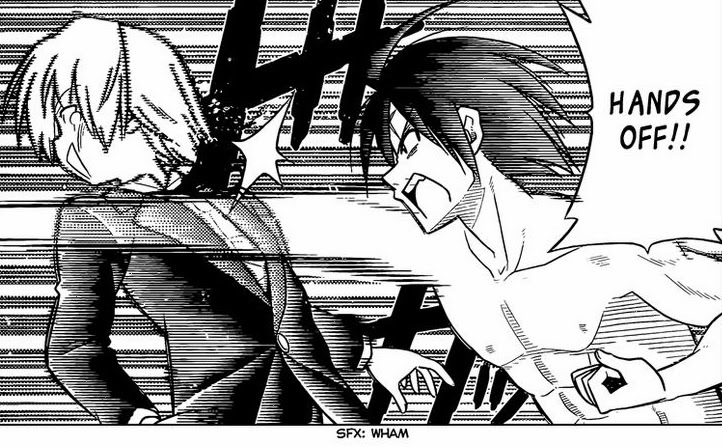 The catch is that if Hayate loses, he’d have to take on the entire debt of 8.92 million yen. Nagi intervenes by offering to loan Hayate the money because getting the King’s Jewel is her problem after all, but Hayate refuses and wants to settle things with his brother on his own. Ikusa smirks and hands Hayate over a contract to seal the deal. The contest starts as soon as Hayate stamps the seal. Thus, the battle is on… and we’ll find out what happens next week. 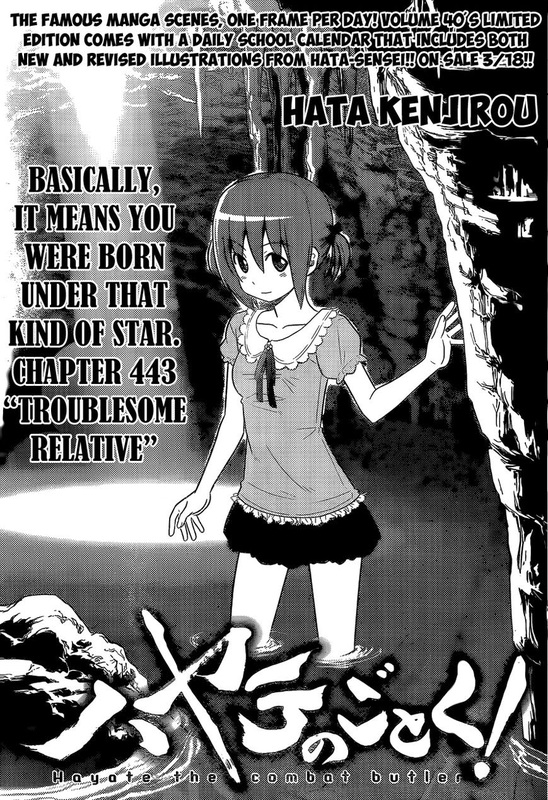 Review: These recent chapters are really quite reminiscent of the earlier non-harem chapters of Hayate no Gotoku, and to be honest, I’m beginning to really like them. 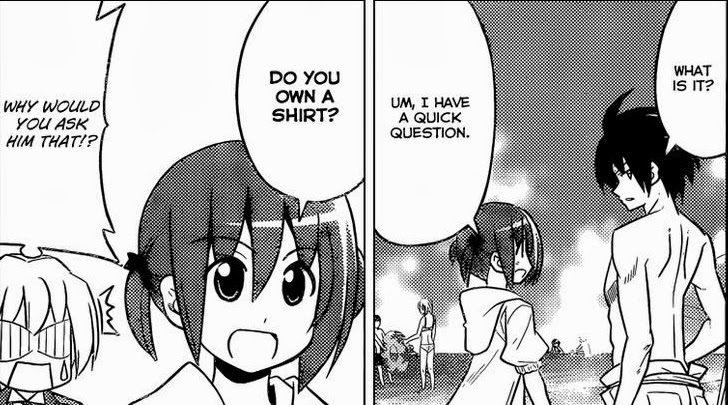 This was actually one of the few chapters since chapter 300-ish that actually genuinely made me laugh – especially when Hamster actually asked Ikusa if he owned a shirt and he answers her so nonchalantly. Shut up, Hayate. This is a matter of vital importance. 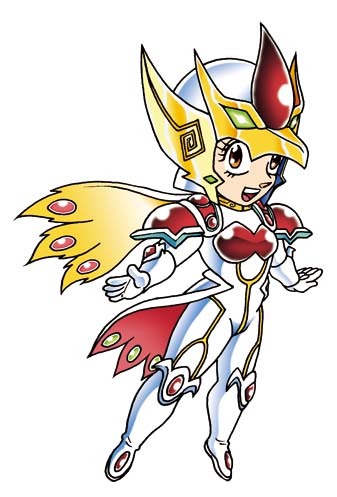 By the way, wouldn’t you think Ikusa would at least recognize Athena since she looks almost the same way she did ten years ago? 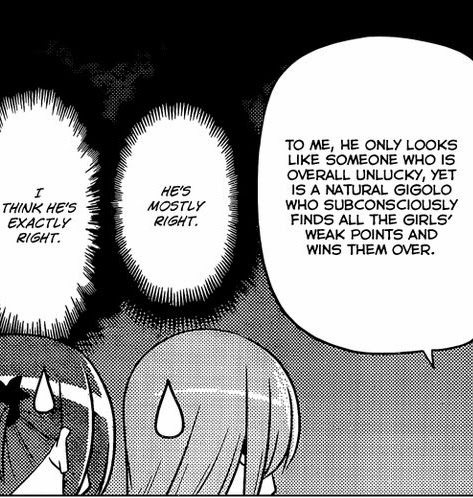 Ah well, Hata will probably find a way to explain that away, or maybe Ikusa’s just not very observant to begin with. So, we have Souya, who I believe is the main character of Lifesavers in this manga now. I wonder if we’ll see that girl who looks like Nagi too. I’d love to see them both together. 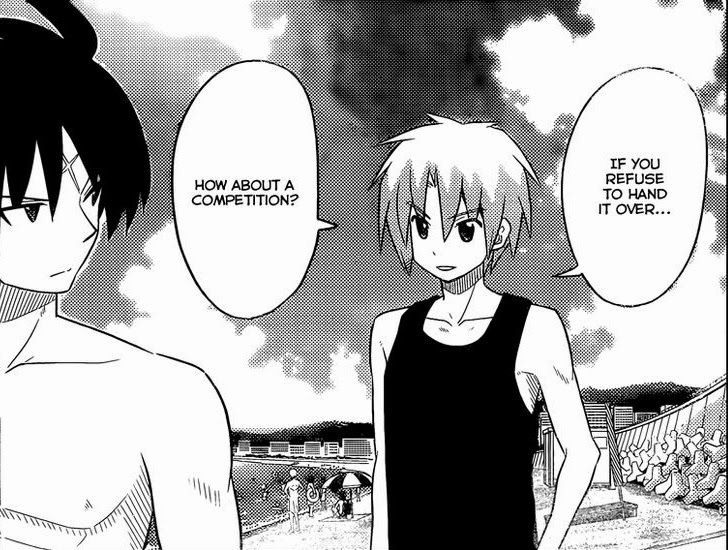 As far as this contest with Ikusa is concerned, it appears as if Hayate has no chance of winning given that he’s super unlucky, especially with money, and the contest is basically all about paying off a debt – yet again. The fact that Hayate is “trembling with excitement,” in his own words, shows that he’s not really all that confident about winning either. However, Hayate does have quite a few things going for him as well. He has HIna and Maria on his side (presumably if they choose to help out), who are both super-competent at just about anything – so they might help to swing the odds in his favor. Hayate himself is also quite experienced in all kinds of odd jobs and we’ve seen how the manager of Café Donguri relies on him. Furthermore, regarding his bad luck, he does have Nagi on his side who (according to word of God) is super lucky, so just having her around might help to counteract his bad luck. And he also has Hamster who… err… is a good friend. (sorry, Ayumu.) Seriously though, she was a really great help to Nagi during the doujinshi arc. 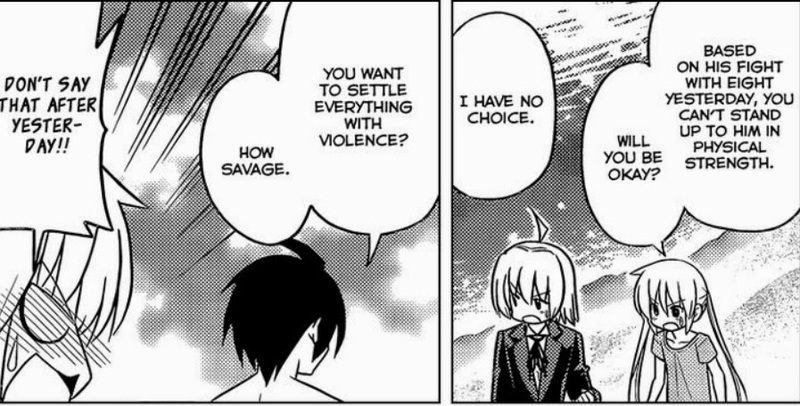 I like how Hayate is apparently the one being put to the test in this arc since IMO, for being the main character, he hasn’t really received that much growth as a character. It would be nice if this was to be his arc and instead of focusing on the harem side of this manga, we’d see Hayate take center stage and experience some genuine character development – perhaps finally getting over his bad luck just this once. Everyone seems to assume that Ikusa really has lost his memories here, but I’m not buying it. Why would he even give Hayate this chance to take his “precious treasure” given to him by his cute little six-year old brother from him in the first place? So uh… Astronerdboy’s still convinced that silhouette marriage proposal girl at the start of these (I’ll call it the seaside restaurant arc) beach chapters is/was Yukariko, Nagi’s deceased mother and while I’m not going to dismiss that just yet, I am more convinced about something mentioned by Doughnut Gunso - which is that the Silhouette girl was Makimura-sensei. Also, I’ll add in my own crazy theory to the mix which hit me just now: Silhouette girl might be that Lifesavers girl who looks like Nagi… what was her name? 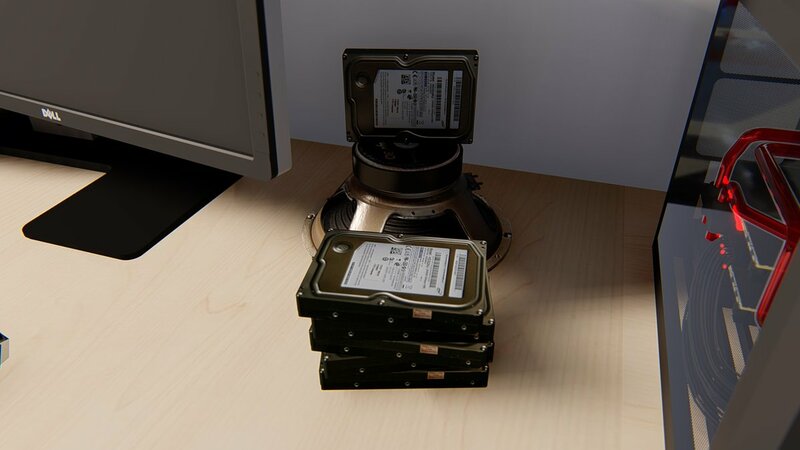 Seto? I know… wrong hairstyle, but maybe she had her hair down eh? Well, we still don't even know what had caused him to have amnesia if he has it, and if it relates to Athena. So he probably just forgot about her as well, or if you're correct about him not having amnesia, a similar reason he is saying he doesn't remember hayate. Also, I might be wrong, but the boy who came at the end is a friend of hayate and the hamster from hayates old school. he even appears in the first chapter of believe. Souya probably was there in the first chapter... was he among the people who invited Hayate to hang out with them? I remember madmac mentioning something similar about the Lifesavers characters appearing in that chapter. Yeah, he was one of them. I believe he also appeared (I may be wrong here.) when hayate learns he doesn't go to his old school anymore, and during the hamsters birthday arc, where he doesn't remember her birthday.